Home Artikel Pramugari Pramugari Citilink Pramugari Garuda Indonesia Pramugari Sriwijaya Air Rekrutmen Pramugari Soal Tes Pramugari Tahapan Seleksi Pramugari Tes Pramugari Garuda Indonesia Tips Video Wanna be FA? Read this first as your essential guide !! To become any type of flight attendant, in any corner of the world, you will have to go to training. As a commercial flight attendant, the airline that hires you will pay for your training. It is completely unnecessary to go to a flight attendant training academy outside of the airline’s training. Do NOT waste your money on one of those flight attendant training academies. Just start applying to the airlines! Your initial investment to become a commercial flight attendant really doesn’t take a monetary investment, but simply requires that you invest time to fix up your resume, apply online and complete the test and interview process. For brilliant sources, you may learn from Paket Pramugari V2. We would love to be part of your journey on the road to becoming a cabin crew. As one of the most respected online cabin crew electronic books in Indonesia, Paket Pramugari V2 can help make your dream a reality! Prepare yourself for an exciting career and travel the globe. Have knowledge is our best advice! All successful and exciting journeys start with a plan! We encourage everyone to ensure they have the knowledge they need and that’s what our expertise provides. Paket Pramugari V2 and the bonus were specifically designed to provide leading edge knowledge to those who wish to enter the aviation industry. Many factors play a part in you becoming a crew member. In addition to personality, ability, and customer service experience - knowledge is critical to your success. Paket Pramugari V2 is designed to give you that knowledge. 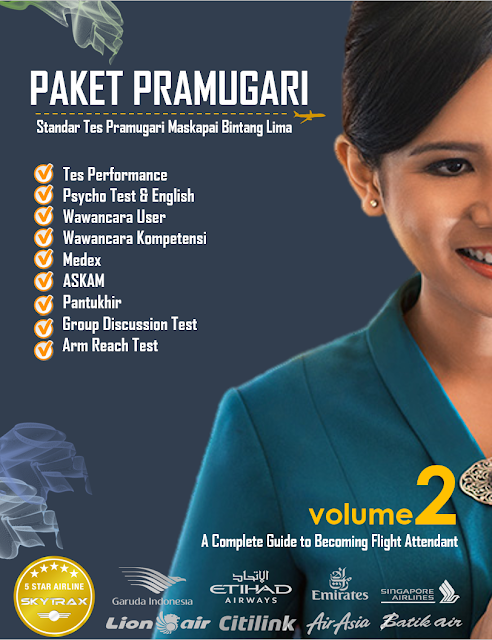 Paket Pramugari V2 offers the first and most comprehensive sources for your Flight Attendant test! Become a Cabin Crew and follow your dreams!